Not only are men more fashion and skin aware, they care about their hair more now than ever. Unfortunately, it can look great one day, and dull and drab the next . But it doesn't have to be that way. It's amazing what a little cut and style can do for your image and self-esteem. Whether you have a lot of hair, or just a little, we've got some care, cut, style and color tips to keep it in tip-top shape, working the best with what nature and genetics gave you. 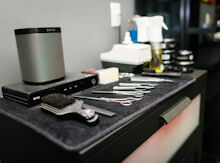 Men need their hair trimmed more often than women do, approximately every 4 weeks. Don't hold on to an outdated look. Ask your stylist for an updated haircut and style that will compliment your natural texture and part. Try a different salon if you're ready for a change. Both male and female stylists can give you some great ideas for color, cut and style. If your hair is thinning, don't fight it. Stick with a short cut, or consider shaving it all off, a la Vin Diesel or Bruce Willis. If your hair gets frizzy in the Summer, use a little mousse, gel or styling product designed specifically for frizzy hair. Eat a healthy, well-balanced diet to ensure shine. Hair color gives your hair an instant turbo-boost for shine, making it appear thicker and healthy. Some men look fabulous in gray hair but others fight it regardless. If you're getting grays, try going back to the natural hair color you had in your younger years. The same goes for a beard and sideburns. If you color your hair at home, always do a test strand, not only for an allergic reaction -- but for hue. The longer you leave the color on, the darker it will be, of course, unless you're going lighter. "Just for Men" hair color is highly popular due to a great product and marketing efforts. Plus, the name gives you that macho feeling. Try a semi-permanent hair color designed for men to find that perfect shade and shine. Coloring your hair swells your hair shaft and will make it appear fuller.